On May 8,1855, in the days before there were any bridges across the wide Missouri, a surveyor named Charles Manners and two teams of eight surveyors under contract to the US government crossed the already fabled and still untamed river in a canoe piloted by a local Native American tribal member. It took them several trips back and forth across the river to move the entire team and all their gear. On the last trip the canoe almost swamped and sank because it was overloaded down to the gunnels with a cast iron monument that weighed between five hundred and six hundred pounds. The surveyors noted in their records that only the considerable paddling skills of their Indian canoeist kept them from sinking. Once the survey team and their gear were safely on the west side of the Missouri, they hauled the iron marker to a high bluff overlooking the river valley. 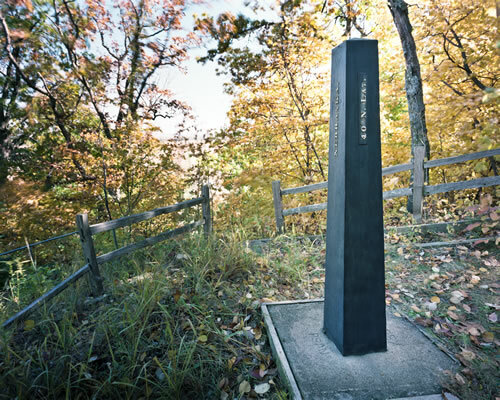 After some searching they found a wooden post overgrown with weeds that had been erected the previous year to mark the place where the fortieth parallel of latitude intersects the Missouri. Here, at that point, they erected the cast iron monument to permanently mark the boundary between the two new US territories of Nebraska and Kansas, which at that time stretched all the way west to the Continental Divide. The slender pyramid-shaped marker was about six feet tall and sixteen inches square at the base. It had been cast at a foundry that winter in Saint Louis and shipped upriver. That survey monument would become the first point from which the unfolding American social and political geography of the Central Plains would be measured and defined. Over the next few years and decades these surveyors, and the other teams of surveyors who followed them, would mark out grid lines and boundaries throughout the American West measuring, observing, noting, naming, and recording the remarkable and ordinary features of the natural world they encountered. Within a few decades most of the tribal lands in the Central Plains had been ceded to the government through warfare or treaty and the tribal people moved onto reservations. In the “taming” of the west, those nineteenth-century surveyors were in the avant-garde that preceded settlers, railroads, and towns. Without the surveys, nothing could be claimed or legally owned. Today we take for granted that the land we occupy is laid out in one-mile squares, thirty-six to a township, county by county and state by state, in an unrelenting march across the prairies and mountains of the west. Most of our roads, fence lines, and towns are laid out in deference to this system. And in our prairie state of Nebraska very little gets in the way of the regularity of this grid. But for thousands of years before government surveyors laid out this system there were natural boundaries and landmarks that were used by tribal people to find their way. Trails ran north and south, east and west—rarely seeking the rigid cardinal directions, but many following or linking the region’s many life-sustaining watercourses. This natural world, for many millennia previous to the surveyors’ nineteenth-century boundary-fixing moment, had been known to the indigenous native peoples to function within their own systems of belief and logic that allowed for and even revered impermanence, a cyclical understanding of time and unexplainable mystery. Spirits dwelt along meandering streams and in other sacred places, as did the animals that the people valued and considered their relatives. The bison returned with the grass each spring. Ancestors had been born, lived, died, and went back to the earth in places whose names few now even know or remember. Today it is hard for us to see or feel anything from that world the surveyor’s relentless grid replaced—but occasionally we can catch glimpses. 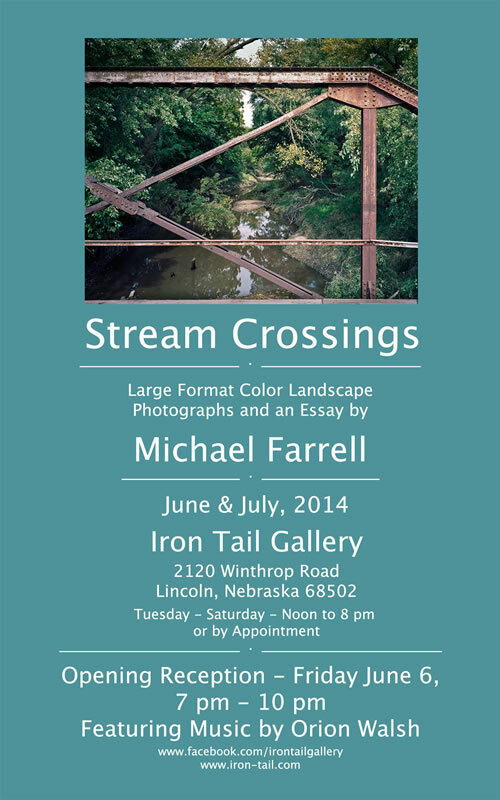 The photographs in this collection were made at points where our modern grid intersects with the ancient rivers and streams of eastern Nebraska. Driving on county roads through eastern Nebraska usually means traveling in a straight line toward the vanishing point of one of the cardinal compass directions visible through the windshield in the far distance for miles and miles. Although straight-edge views of barbed wire fence lines, corn or soybean rows, and aging shelterbelts do not usually invoke the memory of Thomas Jefferson, they should. Almost all of the land in the United States outside the original thirteen colonies was measured, demarcated, and transferred into private hands or set aside as government holdings through the Public Lands Survey System that Jefferson invented in the late eighteenth century. Jefferson and his father were both surveyors in the Virginia colony prior to the American Revolution. And Thomas Jefferson was greatly influenced by the ideas of scientific rationality, popularized in what became known as the Age of Reason or The Enlightenment. After the Revolutionary War, both Jefferson and our second president, John Adams, wanted to encourage land ownership by people of modest means. The system that Jefferson created was based on measuring and dividing land into repeatable, standard, one-mile-square gridded sections that could be further divided, sold, or, in his and Adam’s particular cases, granted to former Revolutionary War veterans in compensation for their service. The Public Lands Survey System was expanded into almost every state west of the Ohio River and later became the basis for administering Abraham Lincoln’s federal land grants to the Union Pacific Railroad and the system for parceling and settling western lands under the Homestead Act. Thomas Jefferson particularly put his mark on the lands of the Louisiana Purchase, of which Nebraska is a part, when he as president sent the explorers Meriwether Lewis and William Clark out into these western territories to discover what he had acquired from the French in 1803. Jefferson thought that the Louisiana Purchase lands would, for at least a century, provide a buffer zone for the free-living and “unmanageable” indigenous tribal people who were to be removed west of the Missouri River and out of the way of the westward expansion of the nascent United States. But even before Lewis and Clark returned, entrepreneurial-minded Americans began to venture out into the new territories, seeking wealth in the form of furs or trade with the Indians. Not long after, hordes of westward-bound agricultural settlers, gold miners, and religious seekers followed the Platte River and its tributary, the Sweetwater, upstream to the crest of the Rockies and beyond to Oregon, California, and Utah. By the late 1840s capitalists in the east were clamoring for a transcontinental railroad and debating the merits of several proposed routes. The discovery of gold in California in 1848 only fanned the flames. When Illinois Senator Steven A. Douglas proposed the Kansas-Nebraska Act in 1854, his purpose was to pave the way for admitting new states into the Union along the fortieth parallel and, in so doing, create impetus for developing a central (thereby Northern) route which would favor Chicago or Saint Louis over any competing Southern proposal for the railroad. But the primary cause for concern soon became the debate over the expansion of slavery into the territories of the Louisiana Purchase. “Popular sovereignty” was Douglas’s proposal that the citizens of the new territories would decide for themselves about whether or not to enter the Union as slave or free states. Originally he had proposed only a Nebraska Act, which would have led to the organization of one state, but in an effort to placate truculent Southern lawmakers, Douglas divided the territory into Kansas and Nebraska, and that offered the possibility that through the decision of the territory’s voters upon admission to the Union, one or both could become a slave state. Soon the resulting attempts to promote and expand slavery in the new Kansas Territory led rapidly to violence between abolitionists and pro-slavers and became a precipitating factor in the outbreak of the Civil War in 1861. Once that ill-fated “Act to Organize the Territories of Nebraska and Kansas” was voted into law in 1854, but before any of the new lands could be taken up as property or settled legally by any citizens, the two new territories would need to be surveyed. In most of Nebraska the streams, creeks, and rivers drain to the east, joining larger bodies eventually to merge with the Missouri River. And they meander in sinuous curves as they make their way across the prairie landscape. Except for Alaska, Nebraska has more river miles than any other state. 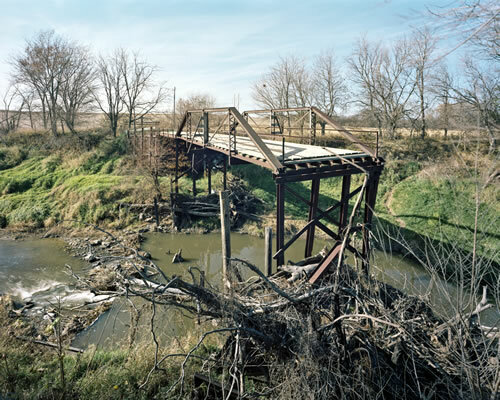 While almost all of the tallgrass prairie of eastern Nebraska was plowed up in the early settlement period of the late nineteenth century, the rivers and streams mostly escaped such complete destruction. Although many were channeled to promote drainage and dammed to create reservoirs, and their associated wet meadows and isolated rainwater basins were drained to create more tillable land, the rivers and streams today remain important corridors for wildlife and riparian zones of prairie and woodland habitat. But with the exception of our largest rivers that support recreational boating or canoeing, most of our streams are hard to see or experience. Here, if someone is in a boat or canoe floating on a stream, that person legally is in public space, but if that person steps out onto the bank or onto the streambed, that person is likely trespassing. The water is public, but the land on and through which it flows usually is not. Because so much land in Nebraska is in private hands, the rivers and creeks, as systems of habitat including their beds and banks, are off limits to most of us most of the time. However, those meandering natural systems intersect with the mile-square grid over and over again. And it is here, where our need to impose a system of regularity and measurement has resulted in a rectilinear road system that adheres to the dictates of Jefferson’s grid, that we can more easily see and touch our streams and rivers. County roads checkerboard the eastern part of Nebraska, providing a grid of public space along their rights of way. Beginning in the 1870s, Nebraska’s county roads were constructed on a right of way that is sixty-six feet wide. Most gravel and dirt roads are twenty-four feet wide. So that leaves a space on either side that is public land. Where the roads cross streams there are bridges and culverts. Over the years most of the older bridges have been replaced with modern concrete spans that are not very visually interesting. But in some places there still exist handsome early twentieth-century steel truss bridges or very early examples of reinforced concrete spans that have a bit of romance to them. For a number of years I have been seeking out these old bridges and the streams they cross to photograph. My paramour, Lynne Ireland, and I usually head out around dawn hauling my eight-foot by ten-foot Ebony view camera, half a dozen lenses, filters, film holders, light meter, tripods, and a six-foot folding ladder, along with a lunch, drinks, and maps in my old Toyota 4Runner. By the end of the day I hope to have a handful of negatives exposed. 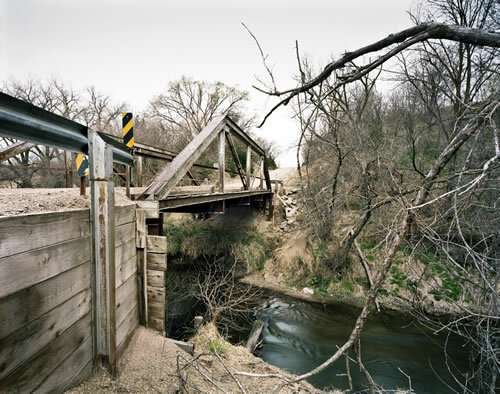 There are online tools to help locate historic bridges county by county. But these sources can only show that a bridge was still there the last time a respondent visited and verified it. Many of these bridges are in serious structural disrepair, and many are being replaced or closed to mechanized traffic due to these problems. Google Earth is a help but can’t show what it is like to stand on the bridge in question at a particular time of day or in the varying weather of an actual on-the-ground encounter. For every bridge that I photograph there are three or four that don’t pan out. Either they are no longer there or the light is no good or there is no vantage point that would make for an interesting photo, etc. And not every one that is photographed ends up being scanned and printed. So the photographs included here are a distillation of the entire seek, encounter, capture, process, scan, edit, and print process. 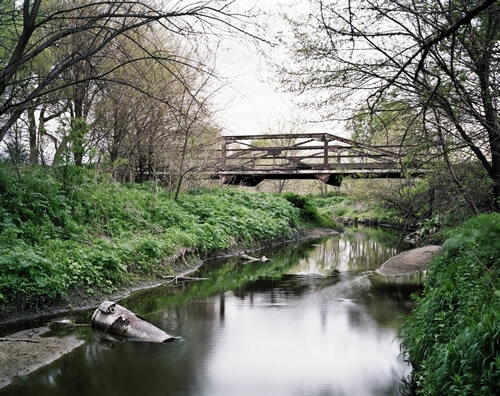 To look at these photographs is to encounter certain troubling aspects of our relationship with our rivers and streams. In almost every location that I’ve visited the bridge is a site for trash dumping and graffiti. Broken bottles and crushed aluminum cans indicate littering drinkers. Discarded tires, appliances, and mattresses are common. Bordering farm fields are worked right up to the edge of the right of way in most cases. Today’s farms are much larger than a century or more ago. The outmigration of farm families is apparent in the occasional abandoned farmhouse and barn seen on our trips. Today’s farmers are driven to maximize profit in order not to go the way of the Indian people, whose time on these places is now only evident through place names like Nemaha, Nehawka, and Otoe. It is hard to know what the water quality is like just from looking, but our region is known for serious agricultural chemical runoff that has an impact on our streams and rivers and all who depend on them. It has been a long time since the water in any of these locations was safe to drink. At the same time there is usually abundant animal sign—deer, coyote, raccoon, skunk, beaver, or muskrat—and snapping turtle. I see owls, hawks, woodpeckers, and meadowlarks. Insects, snakes, and occasionally a frog. Grasses, flowers, plants, and trees along these watercourses find havens that are rapidly disappearing from the remaining prairies and croplands in this, the age of lucrative ethanol subsidies. 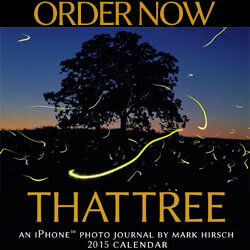 But difficult questions surface over and again with each photographic encounter. I leave my vehicle and walk to the bridge, hauling my gear to the span or along the river bank. Sometimes I trespass, and sometimes I don’t. But I am always aware that I am but a momentary visitor. Many have walked here before, and many will follow. Our time is not long in this place, and we, for all our technology and modern image-gathering tools, understand and truly know far less than we see. If our water is considered to be a resource owned by the public, what of these complex river systems? How can we divorce our watercourses from the life-giving water that runs through them? Isn’t a river, creek, or stream an integral natural system overflowing with all manner of life and complexity—including our own? Does a river or stream, as a complex living habitat, have a kind of integrity that should be considered to be inherently something other than private property? We know more now, and our attitudes have evolved from what we understood or assumed in the time of Jefferson or Lincoln—or the bully Roosevelt boys—or even Richard Nixon, signer of the Endangered Species Act, for that matter. If a corporation can now have legal standing to speak out and influence laws or elections, what standing accrues to a river or stream, without whom none of us can live? And, if so, who among us will be empowered or emboldened enough to dare to speak out or to act on behalf of our essential yet increasingly vulnerable watercourses?